The photo above shows a section of the Tin Mines Fire Trail near its intersection with Mathewson's Fire Trail. A Hume and Hovell Walking Track sign can be seen to the left of the road in the above image. A larger photo and a link to further information appear lower on this page. Canopy and sky above Mathewson's Fire Trail, near the intersection with Tin Mines Fire Trail. Jan 2015. 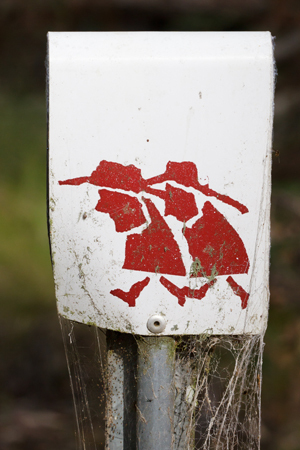 Right: Hume and Hovell Walking Track sign, Tin Mines Fire Trail near the intersection with Mathewson's Fire Trail. Jan 2015. 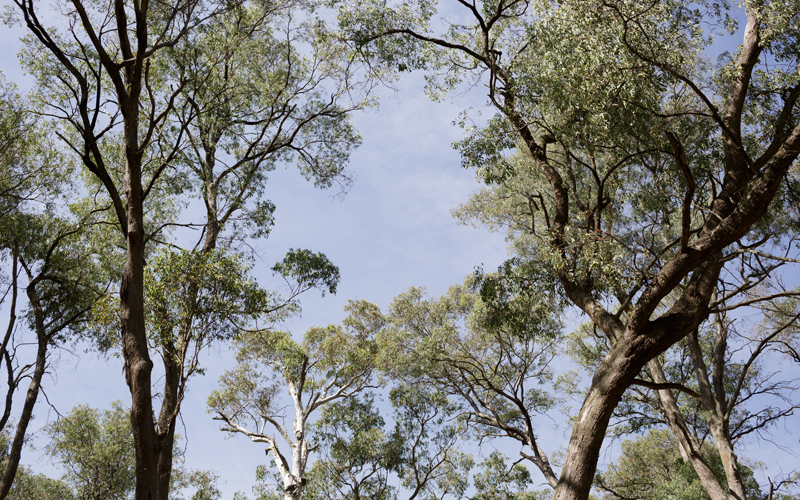 The 440-km Walking Track passes through Woomargama National Park on its way between Yass and Albury, NSW. Eucalyptus trunks beside Mandaring Fire Trail. Presumably the fire that burnt the trunks occurred some years ago. 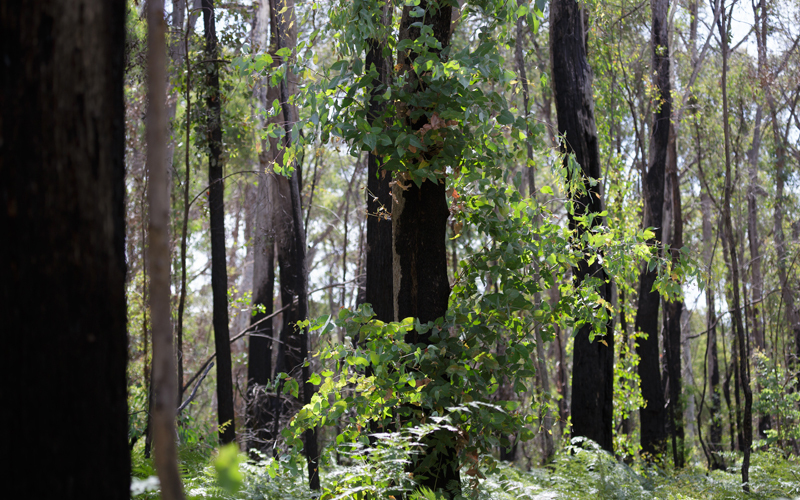 For information on fire history up to 2006, see the NPWS Woomargama Draft Strategy link above. Jan 2015. 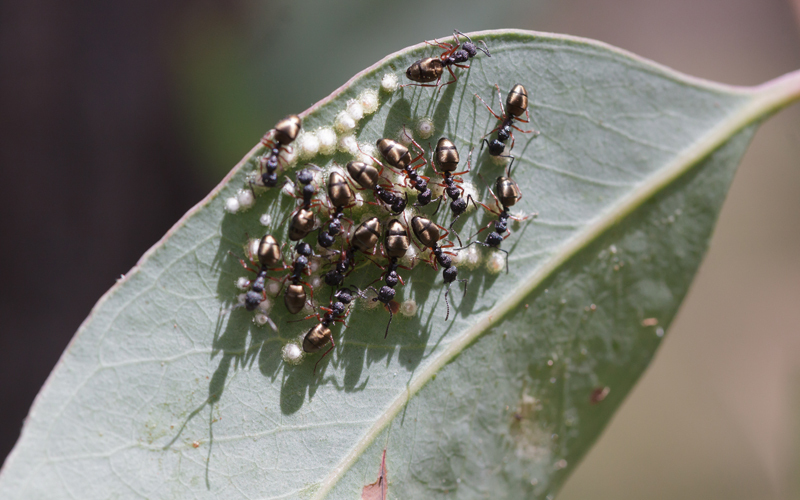 Ants of a Dolichoderus sp tending honeydew-producing Psyllid nymphs on a Eucalyptus leaf near the intersection of Tin Mines and Mandaring Fire Trails. Jan 2015. 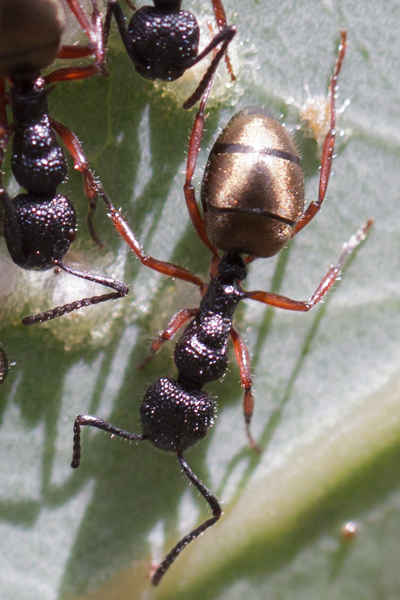 Closer views of ants of a Dolichoderus sp showing large gold abdomen, textured head and mid section of the body, upward-pointing spines in front of the narrow waist, and elbowed antennae with many segments past the bend. 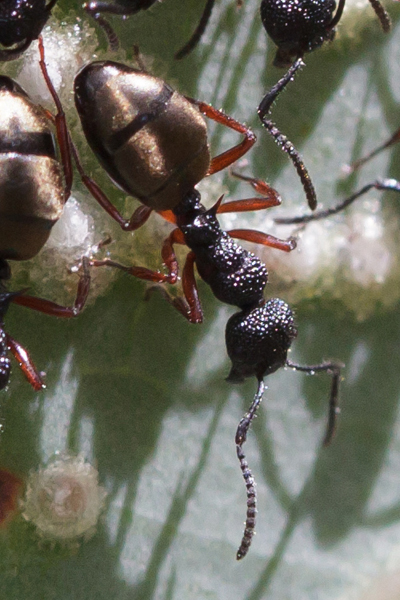 The Psyllid nymphs are beneath their protective honeydew shelters (lerps). Jan 2015.